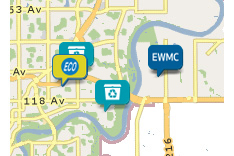 Edmonton’s Community Recycling Depots are a convenient way to dispose of recyclables from your home or small business. Most locations are open 7 days per week, 24 hours per day. Each bin has a label on the front to tell you what type of product should be placed in it. Please carefully read the labels and follow the instructions. Recycling Depots accept: paper (including shredded paper, newspaper and magazines), boxes, cardboard, plastic bags, and all recyclable containers, cans and bottles. Recycling Depots do not accept: furniture, tires, home renovation material, mattresses, bikes, household hazardous waste or any kind of home appliances (fridges, stoves, washers, dryers, monitors and TVs), among other things. These items should be taken to an Eco Station, Big Bin Event or the Edmonton Waste Management Centre. It is illegal to leave garbage, non-recyclable materials, and large items such as fridges, renovation materials and furniture at the City’s Recycling Depots. Illegal dumping at Recycling Depots is monitored and offenders will be fined $250. Find out what materials are accepted in Edmonton's blue bag, blue bin and recycling depot programs. Information on how the City receives and responds to complaints of illegal dumping.